What is home? For me, it is the redwoods. Whether you’re hiking, biking, or in my family’s case, driving, you just can’t beat the redwood forest. Not only are these trees beautiful beyond measure, but they are also a place of bonding and healing. Joaquin Miller Park and Redwood Regional Park have always been my family’s favorite places, and I will always think of them as places of comfort and sanctuary. Student Perspectives: Have You Taken Advantage of Nature Yet? According to The Outdoor Foundation, just under half (49.2 percent) of Americans participated in an outdoor recreational activity in 2013. If you have not visited a national, local or state park lately, you are missing out on a great way to engage in outdoor recreation. Visiting parks not only supports a healthier lifestyle, but also an opportunity to learn. Although this park may be small in comparison to others, it is not lacking in variety of activities and scenery. From mountain biking to attending an outdoor play, this park has opportunities for people of all ages to enjoy, all while being removed from the bustle of the surrounding cities. 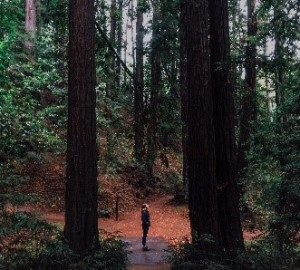 Go to Joaquin Miller Park to discover the magic of the redwoods. Just minutes away from San Francisco and East Bay towns, you can take advantage of this local park any day of the week. Only 9 miles from downtown Oakland, Joaquin Miller Park offers amenities you can’t find in most cities: fern-lined creeks, wet meadows, redwood groves and oak woodlands.